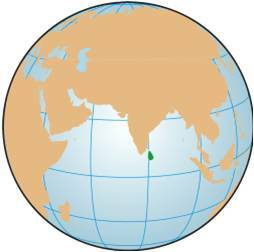 Sri Lanka is an island nation off the southern tip of India in South Asia. It was populated mostly by Buddhists called Sinhalese until Europeans took over. Before then, the island had three kingdoms, namely Kandy in the central hills, Kotte on the Western coast, and Jaffna in the north. Europe never seemed to like non-white kingdoms. The Portuguese attacked first, then the Dutch. They built an incredible fort -- a walled city -- in the southern city of Galle. The British then took control through the British East India Company in about 1800. The Galle Fort is an incredible colonial vestige. 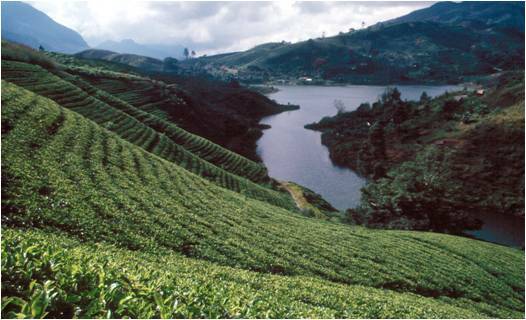 The British grew tea plantations when they controlled the island, and they brought more people over from the south of India to work the plantations. These people were Hindu, from the Indian province of Tamil Nadu. They are known as Tamils. There were also Tamils already well established on the island. Historically, Moslems traveled extensively throughout Africa and Asia -- all the way down to Indonesia. There are many Moslems in Sri Lanka today. Sri Lanka declared independence from the British in 1948, becoming the Commonwealth of Ceylon. Located off the southern tip of India. Once known as Ceylon and now called the Democratic Socialist Republic of Sri Lanka, the country has a population of about 20 million -- about the same number as New York State. It covers territory the size of 'Almost Heaven,' West Virginia. Interestingly, Arabs called Sri Lanka "Serendib," from which comes the word "serendipity" -- the lucky tendency to find an interesting or valuable thing by chance. Sri Lanka is derived from the Sanskrit word "lanka," meaning "island." Not just any island, but the island described in the ancient Indian epics Mahabharata and the Ramayana, which are the basis for Indonesia's shadow puppets. Ethnically, today Sinhalese make up 74% of the population, with Tamils comprising 19%, and Moors (Arabs) about 7%. Theologically, Buddhists comprise 70%, Hindus 15%, Christians 8%, and Moslems 7%. Sri Lanka's primary industry has been tourism, although a decades-long conflict in the north, the Tsunami, and now a global recession have crippled the tourist industry. Most of the tourists have been British and German. 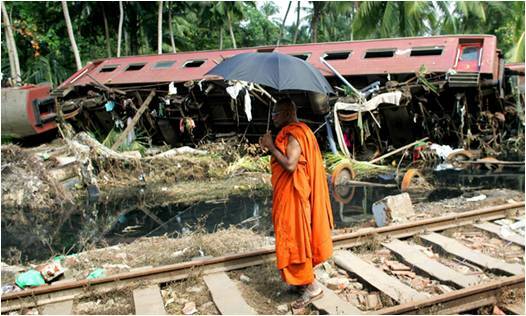 After the destructive Tsunami in Galle, Southern Province. It is not all tourism. Tea, rubber, and textiles have played a major role in Sri Lanka's economic development. 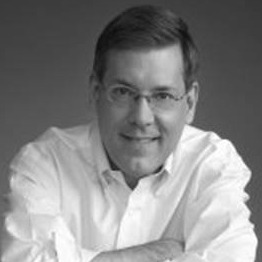 The country has a per capita gross domestic product of about $2,000 per year. Sri Lanka is hot. Very hot. The average yearly temperature ranges from 82 to 88 degrees, although in the central highlands the average temperature is 61. The tallest mountain is taller than Mount Washington in New Hampshire, at over 8,000 feet. The central highlands near the city of Kandy. The island does not have our seasons, but rather the monsoon, which brings rains. Sri Lanka is humid. In the capital, Colombo, humidity is above 70% all year round, rising to almost 90% during the monsoon season in June. 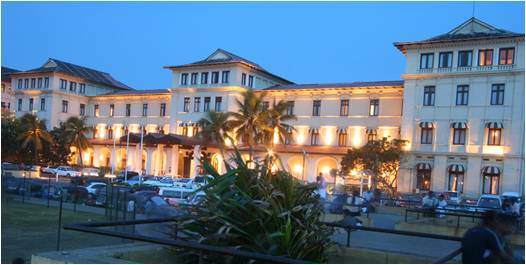 My favorite hotel in Sri Lanka is the Galle Face in Colombo. 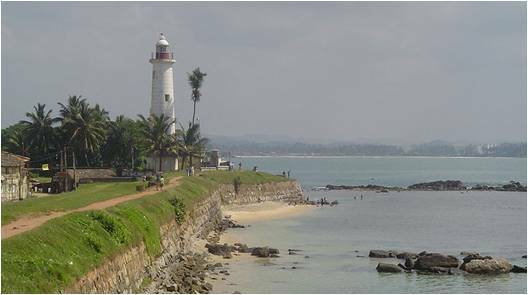 The city of Colombo was established as the administrative center of the British colony, and the British established modern schools, colleges, roads and churches that brought European education and culture. According to Hindu mythology, a land bridge to the Indian mainland, known as Rama's Bridge, was constructed during the time of Rama. Often referred to as Adam's Bridge, it now amounts to only a chain of limestone shoals remaining above sea level. 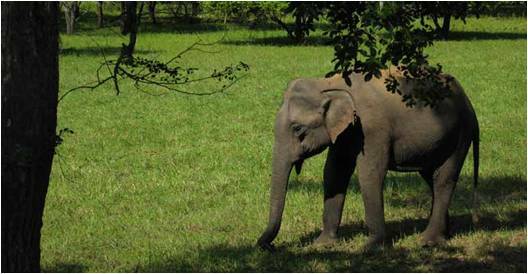 Another nature fact: the Yala National Park in the southeast of the island, founded by the British, protects herds of elephant, deer, and monkeys. I have been driven around it in a jeep and it is surprisingly similar to an African safari. An elephant inside Yala National Park. There is a dark side to Sri Lankan politics, just as Malaysia and Indonesia had their years of living dangerously. In the late 1950's one of their political leaders used race and religion to divide the people and gain power. He did horrible things, and the people allowed it. They declared that Sri Lanka was a Sinhalese nation. They mandated Sinhala, the language of Sri Lanka's majority Sinhalese community spoken by over 70% of Sri Lanka's population, as the sole official language of Sri Lanka. This forced large numbers of Tamil civil servants who could not meet this language requirement to resign. Social instability reigned. Soon, an attempt to make Buddhism the national religion, excluding Hindu and Islam, was also made. So-called 'affirmative action' in favor of Sinhalese -- in a similar line to Malaysia and Indonesia -- was also instituted. They claimed this would reverse colonial discrimination against Sinhalese in favor of Tamil. 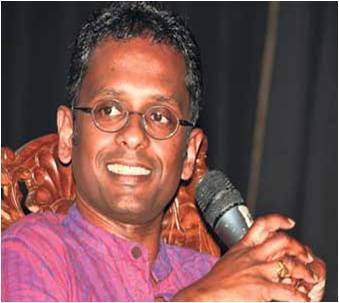 Sri Lankan-Canadian author Shyam Selvadurai. One of my favorite writers is the award-winning Sri Lankan-Canadian, Shyam Selvadurai. His riveting novel Funny Boy, about coming of age as a gay Asian, is set with the backdrop of anti-Tamil sentiment, where the characters in his family are beaten -- even murdered -- by the politically-blinded Sinhalese crowds. Trust me, you would have rooted for the Tamils during this dark period. It was truly horrible. Many Tamils wanted to fight back and began to call for a northern state where they could live in peace, not a strange desire at all considering the bloodshed. Over time, the Sinhalese politicians quieted and the lynch-mob mentality waned. Sri Lankans began to embrace diversity, and Tamil was accepted as a national language. The Constitution was revised to make Sri Lanka a multi-ethnic and interfaith nation. 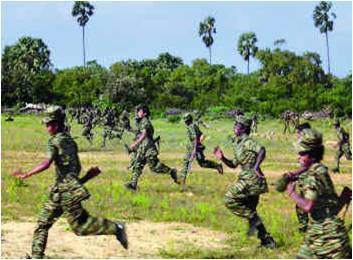 The Tamil Tigers have been defeated after 26 years of terror. The Tamil Tigers were born during this era, resorting to terrorism and refusing to accept that they were no longer being targeted as outsiders. The leadership refused to join the national mainstream as it moderated, and pushed their people to demand separation. Although the Sri Lankan nation had moved forward and embraced diversity, the Tamil hard-liners rejected peace, perhaps because they desired power. Turf. They pushed for control until they were finally defeated, only a few weeks ago. As repressive as Sri Lanka was in the 1950's, the nation led the world a decade later. In 1960 the people of Sri Lanka elected the first-ever female head of government in the world. America has yet to match this mark. Through the Cold War-era, Sri Lanka followed a foreign policy of non-alignment but has remained closer to the United States and Western Europe. Sri Lanka has also received considerable assistance from China. Even though the military has been busy fighting the Tigers, Sri Lanka has also contributed soldiers to the United Nations Peacekeeping Mission in Haiti. I have met many a peacekeeper in Port-au-Prince or Gonaives who are from Galle. 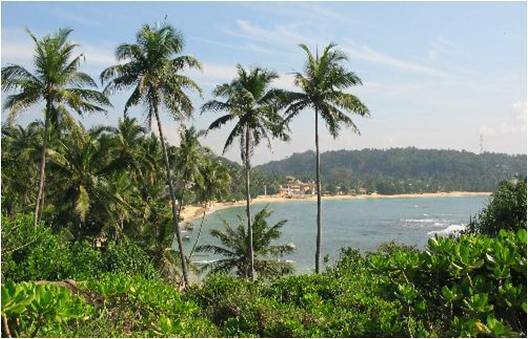 My favorite beach in Sri Lanka is located in Unawatuna. I personally hope to retire to this hot, multi-cultural nation. Having built orphanages here, as well as in Haiti and Indonesia, through Orphans International Worldwide, I have to admit that I like the cities of Jacmel and Manado as well. But I dream of growing old in Galle, in the Southern Province of the nation of Sri Lanka.